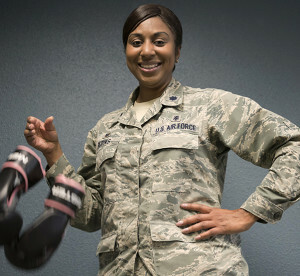 Lt. Col. Felicia Burks, the 92nd Medical Support Squadron commander, drops a pair of boxing gloves Oct. 21, 2016, at Fairchild Air Force Base, Wash. During her fight with cancer, Burks took up boxing as a way of staying physically fit. 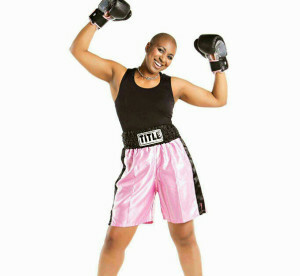 To her, the dropped gloves signify the end of her fight with cancer. These routine checks only took a few moments of her time. But her eyes widened as her fingertips suddenly found a lump on her left breast, and her breath caught in her throat as she realized what it might mean. It was May 2014, and she was a health services administrator finishing a tour in the 673rd Medical Support Squadron at Joint Base Elmendorf-Richardson, Alaska, only six weeks shy of assuming a command position at Royal Air Force Lakenheath, England. She went to the hospital and was diagnosed with “triple negative” breast cancer. Breast cancer is called triple negative when it does not grow in the presence of three known receptors – the estrogen receptor, the progesterone receptor and the HER2, or human epidermal growth factor receptor 2. Approximately 15 to 20 percent of breast cancers are triple negative. With no family in Alaska, she said the prospect of going at it alone was nerve-wrecking. Burks’ Mother’s Day gift to her mother that year was the disturbing news she (Burks) had breast cancer. “It shook something in me for a moment, but I realized I had to reach out so she could be a source of strength and support for me,” she said. Unfortunately, her parents were unable to travel, but her sister was able to be with her for the surgery. Coming to terms with the disease, Burks said she wondered how it would affect her 23-year-long career. Growing up in Grady, Alabama, Burks wanted to enlist after being inspired by her uncle’s service in the Army Reserves. “I was 17 at the time, my mom actually signed the papers for me to join the military,” she said. The multi-service veteran served in the Army Reserves as an automated logistics specialist from 1993 to 1999 before being commissioned into the active-duty Army, where she spent several years in various roles including an executive officer, administrative officer and a company commander. But she said she dreamed of a different path, one of putting others before herself by helping people heal as a health services administrator. After years of serving her country, it was her turn to be served. Surgery to remove the cancer took place only five days after diagnosis. The surgery was followed by six weeks of fertility preservation and then four-and-a-half months of chemotherapy. The chemotherapy took its toll. Burks was exhausted. She lost most of her eye brows. Her nails became brittle and dark. Her skin appeared dehydrated. “When faced with anything, we can either fight it, or run from it,” she said. She shaved her head, rather than watch her hair shed away. Combating the effects of the therapy, she took vitamins and monitored her diet – she was determined to win. In addition to her sister, Burks also found support through her wingman and church families. 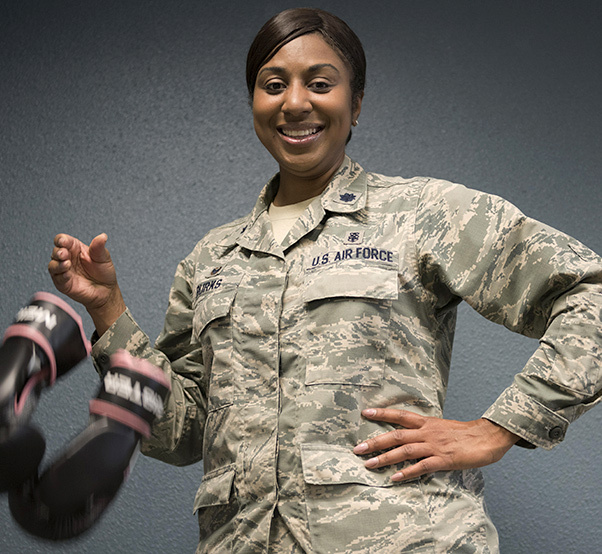 Lt. Col. Felicia Burks shows her resiliency by taking boxing while she battles breast cancer on Joint Base Elmendorf-Richardson, Alaska, in 2014. 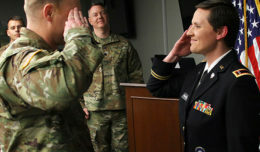 Burks ultimately defeated cancer and went on to a command position at Fairchild Air Force Base, Wash.
Burks and Maj. Jennifer Pearl, a colleague in the same field, had been friends since 2006 when they met at Health Service Administration School at Sheppard Air Force Base, Texas. They re-connected at Elmendorf in 2012. “My period of adversity drew us closer and she taught me wingmanship on the next level,” Burks explained. The believer also said she found support through a non-military community she held close to her heart. Burks will always consider Shiloh Mission Baptist Church in Anchorage to be her church home. They became her extended family. 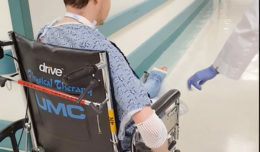 The treatments took place in medical facilities including the military treatment facility, Mat-Su Regional Medical Center, Providence Alaska Medical Center and Alaska Regional Hospital. Burks said the overall process developed her, and made her view life differently. “I’ll always reference the quote of Winston Churchill, ‘Mountaintops inspire leaders but valleys mature them’ because it reminds me that adversity almost always primes one for purpose,” Burks said. Burks advises women to pay careful attention to their bodies, to know when something isn’t normal. She also stressed that its important people understand what resources are out there to help. The Air Force officer and cancer survivor hopes people understand what resources are available. There are services to help patients get a wig or prosthetic, clean their house, or provide meals. There are a lot of options out there to help get through these difficult moments, she said. “We’re already trained to fight to overcome adversity, especially in the military,” Burks said, sitting in her office at Fairchild AFB, Wash.
As a survivor, she hopes others will not quit, and will continue to believe in themselves and their purpose. “As I look at myself today, I can clearly see the difference,” Burks explained she finally feels normal again as she adjusted her hair bun, perfecting her professional appearance as she prepared for another day as commander of the 92nd Medical Support Squadron.